Vernacular Architecture Forum - VAF - New England Field Trip to Kensington, New Hampshire! VAF - New England Field Trip to Kensington, New Hampshire! Please join us to see the collection of nineteenth-century buildings located in the town center of Kensington, New Hampshire, and a mid-eighteenth-century center chimney house within the southern part of this rural town in coastal New Hampshire. The day will begin in the Upper Village at the ecclesiastical and civic center of the town, historically called “Meetinghouse Acre,” the site of the original eighteenth-century meetinghouse. The Greek Revival town hall (built 1846) and its two neighbors, the Greek Revival Union Meetinghouse/Universalist Church (built 1839-1840) and the Italianate Congregational Church (built 1865) constitute a highly visible trio of mid-nineteenth-century civic, ecclesiastical, and social buildings situated at one end of the town center. The tour will then move to the Lower Village, affectionately known as “The City” in the early twentieth century, with its collection of nineteenth-century buildings arrayed in linear fashion along the road. The buildings illustrate not only local building practices but also a characteristic southern New England rural village landscape. In the afternoon we will visit a mid-eighteenth-century farmhouse with many of its original historic finishes. 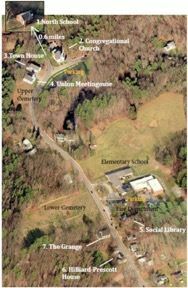 9:45 Meet in the parking lot where you will park (white arrow above), across from the Congregational Church (108 Amesbury Road), our first stop. Your cars will remain there for the morning as all of the morning sites can be seen by foot. 10:00-12:30: The following properties will be open sequentially. The times are approximate. The plan of this distinctive Italianate-styled rural church was modified during construction to accommodate a steeple, which had not been part of the original design. This change during the building process is readily visible in the framing in the belfry. The interior retains not only the majority of its historic finishes, but much of its historic furniture including slip pews and Gothic- styled pulpit furniture. The Kensington Town Hall is an example of a small, mid-nineteenth-century purpose-built town house in the Greek Revival style. It was constructed using some of the framing members from the eighteenth-century meetinghouse, which remain visible in the auditorium. The building was listed in the National Register in 2012. This typical rural church of the Greek Revival period was built 1839-1840 as the Union Meetinghouse for use by several Protestant denominations. 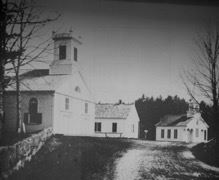 It became the Universalist Church in 1865 and remains in use for summer services and the annual Old Home Day. On the interior, the auditorium layout, seating, and lowered pulpit are characteristic of rural churches of the 1830s. The well-preserved interior features a centered bowed sound bay, rectangular slip pews, and original Grecian style mahoganized painted furniture on the pulpit. The building was listed in the National Register in 2012. This property, still owned by the same family, has a rich history. The building has been the home of multiple generations of the Hilliard-Prescott family. The two-story, single-pile house in the late Federal/early Greek Revival style features several periods of nineteenth- and twentieth-century interior finishes. The spaces in the large mid-nineteenth-century two-story rear ell which has been occupied by a boot manufactory, store and post office, and lastly a residence, augments the main block. The ell also briefly housed the social library, before the construction of the Kensington Social Library across the street in 1894. Evidence of its more public and commercial uses are suggested by the coved ceilings in the second-floor rooms. In the late 1930s the house became home to two households and so the store space was converted to living space. This building is currently undergoing baseline documentation as a prelude to becoming a community center space. Also on the property is a mid-nineteenth-century carriage barn that is being restored. Though the interior will not be accessible, some of the framing may be visible from the exterior. This small brick building in the Queen Anne and Classical Revival styles was designed by George Tilden of the Boston firm of Rotch & Tilden. It retains its plan and historic finishes on the interior. A gift from Kensington native Joseph C. Hilliard who achieved considerable success as an insurance agent, the much loved and used town library has a 1970s addition designed by Earl Bolton, the supervising architect for the Kahn Library at Philips Exeter Academy. Join us at the Grange for a box lunch ($14 per person, [sandwich, chips, apple, cookie], payable on day of tour in cash, or bring your own lunch). Sandwich choices are: Ham and Cheese, Turkey, or Capriese (tomato, fresh mozzarella with balsamic glaze). If you are interested in a box lunch, specify which type of sandwich you’d like, when you RSVP. The Grange, a gable-front building in the Greek Revival style, was constructed in 1838 as the Christian Meetinghouse. Built by the same three men who constructed the Union Meetinghouse and the Town Hall, the building became the Kensington Grange No. 173 Patrons of Husbandry after church membership had declined in the late nineteenth century. It was used for meetings and social events such as dances. Now owned by the town the building remains a community meeting site. After lunch we will visit two buildings that will require driving. Carpooling is recommended. This rural one-room schoolhouse, which remained in use until the early 1950s, is distinctive for its brick construction and plan. Early twentieth-century alterations, in keeping with current ideas about schoolhouse spaces, included a bank of windows along the westerly wall (1918), fir flooring (1937), and edge-and-center-bead board ceiling and suspended milk glass light fixtures (1938). The 1920 rear ell addition retains its separate toilet facilities for the boys and girls, which replaced the original brick outhouse (removed by early 1930s). The building is now maintained by the Kensington Historical Society as a one-room schoolhouse museum. The building was listed in the National Register in 2012. This building began as a three-bay house that appears to have been expanded to a five-bay center-chimney in the late 1750s. The interior was extensively renovated and had some major structural changes in 1769-1770, as indicated by a surviving chalk inscription on an early element. The well-known Kensington native and eighteenth-century joiner, cabinetmaker, and architect Ebenezer Clifford did most of the extensive interior woodwork that includes fireplace wall paneling, mantels including one based on an example in Batty Langley’s “Builder’s Jewel,” paneled wainscoting, four-panel doors with raised panels, and staircase. Built for Nathan Weare, who occupied it until the late eighteenth century, it may have been used as a tavern after the renovations but that has yet to be confirmed. In the nineteenth century several generations of the Spaulding family owned the house in the nineteenth century and at times it may have been occupied by tenant farmers. In the 1920s the property was acquired by Frank Rosencrantz whose descendants remain in this part of Kensington. The land was subdivided in the early 1970s. The current owners are still researching its documentary history, having focused primarily on the architectural evidence up to this point. The address and directions will be provided at lunch. End the day with refreshments at Lynne Monroe and Frank Whittemore’s Adirondack-styled home. The original part began as a small house and connected barn erected in the late nineteenth century by the tenant farmer to the adjoining farm using sections of eighteenth-century buildings remaining from a fire. He was killed by a mad cow, and in 1910 the property became the summer home of the Kenniston family of neighboring Exeter, who named it Sunny Knoll. They were rusticators and enjoyed tennis and gardening and country life. Mrs. Kenniston and her daughter Faith ran a summer camp for girls, converting the barn to living space. Lynne has owned the property since 1984 and beginning in the late 1990s she expanded the building and replaced the original barn, incorporating rustic features reminiscent of those first added by the Kennistons. As part of the design process Lynne consulted with Faith, who was still alive at the time. Completed by 2001, the design emphasizes the rustic or Adirondack-style camp architecture. Kensington, New Hampshire, is just 5.5 miles east of Interstate 95, about one hour from Boston, Portland, and Manchester. · From either I-95N or I-95S, take Exit 1 (Route 107, Seabrook, Kingston). · Go west on Route 107 1.8 miles to Route 150. 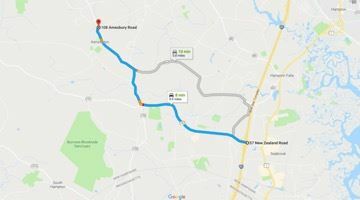 · Turn right (north) onto Route 150 and go approximately 2.1 miles to the village center with the Union Church, the Town Hall, and the Congregational Church. · Park in the lot opposite the Congregational Church, on the easterly side of Route 150 at the corner of Osgood Road. Also, indicate type of sandwich if you wish to order a box lunch. A link to Dropbox for the NR nominations, survey materials, and a walking tour will be made available to all attendees in advance.